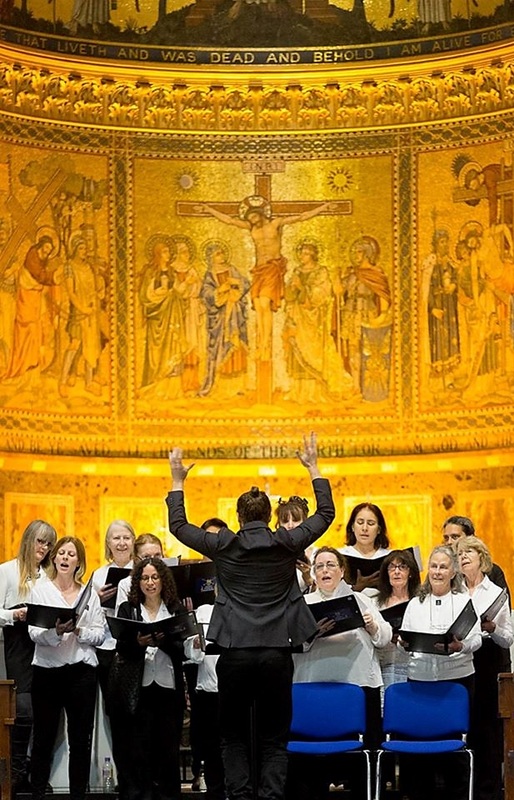 This has been a fantastic year for Westminster Music Library’s choir, Joint Force Singers. Since 2015 they have performed at prestigious venues and events from Lords MCC to Pimlico Proms, Westminster’s Community Awards to the magnificent Guards Chapel at Wellington Barracks. And it was at the Guards Chapel that our grand finale concert took place, a fitting climax to close a year of high achievement. The aim of our year-long project was to raise awareness of Westminster’s Armed Forces by encouraging collaboration with our local community. I can honestly say our choir has achieved this; it’s brought together local people with those who serve and have served their country, people who under normal circumstances probably would not have met. It’s an honour and a privilege to help and support our armed forces and their families, and bringing them together with our Westminster community to sing, make new friends, and most importantly to have a great time, is our way of giving just a little bit back. It will come as no surprise that with Ruairi’ s passion for folk music, the programme featured lots of his own arrangements of traditional songs: “Shenandoah”, (an American folk song), “Scarborough Fair” (featuring a terrific solo by one of our army choir members), and a rip-roaring version of “When the saints go marching in” accompanied by the quintet. But the highlight of the evening was the closing number, which naturally – Ruairi being Ruairi – had to involve some audience participation. For his arrangement of the classic Bill Withers song: “Lean on me”, we were encouraged to clap and stomp our way through the choruses while the singers gave full voice. The choir took their bows and my closing words were accompanied by cheers, rapturous applause and even the odd tear. It’s been a brilliant year for Joint Force Singers, we are grateful to Westminster’s Armed Forces Community Covenant for supporting us and for the invaluable help we’ve received from the staff at Wellington Barracks. But above all we are grateful to our amazing choir, who achieved so much in such a short space of time; Joint Force Singers united Westminster’s Armed Forces and our local community in ways that went beyond the music. Strife, spirit and soul were the themes of Saturday lunchtime’s spectacular performance by Westminster Music Library’s own Joint Force Singers. Think choir concerts are boring? Joint Force Singers made us think again, with their showcase of music in a wide range of styles, periods and even languages! The impressive Guards’ Chapel at Wellington Barracks played host to this exciting event, and a large crowd of music devotees and casual fans alike were entertained and impressed for almost an hour as the choir presented the fruit of ten weeks’ hard labour. Under the directorship of Ruairi Glasheen, this group of singers from all walks of life had been meeting every week since Christmas in anticipation of Saturday’s performance, and we were delighted to see that their hard work had produced such brilliant music. Ruairi, ever charismatic, amused the audience between songs with anecdotes and jokes, and shared the fascinating historical background to some of the pieces, adding even more to our appreciation of the concert. In true Joint Force Singers’ fashion, the choir had a surprise up their sleeve, and bewildered the audience by singing the opening song out of sight, taking advantage of the Guards’ Chapel’s excellent acoustics to capture our attention. All became clear, however, as, one by one, the choir appeared on stage, the music naturally rising in dynamic and excitement as more choir members materialised as if from nowhere. A dramatic crescendo led to a thrilling finish: as impactful an opening song as one could wish for. As Ruairi later explained, the haunting tune was in fact a Brazilian folk song. Since the choir’s formation a mere six months ago, they have sung in several concerts, and in front of many distinguished guests. As a community choir, the Joint Force Singers are committed to supporting local events and causes, as their presence at initiatives like Silver Sunday testifies, and they have hosted numerous successful workshops, sing-alongs and community events. This concert, however, was a chance for the choir to showcase some individual members’ talents, and a real highlight of the afternoon was hearing some beautiful soprano and alto solos by accomplished amateur singers. The choice of repertoire was clearly chosen with these singers in mind, and it was a pleasure to hear their talent so sensitively showcased. As usual, Project Manager Ruth Walters from Westminster Music Library was in attendance to introduce the choir and say a few words about the Joint Force Singers project. Special thanks were given to Tim Heale, London Garrison Welfare Officer, whose partnership in this project has been so valued, and to Ruairi and Hélène for direction and accompaniment respectively! Such a team of committed individuals has been involved in the running of this project behind the scenes, and it was a wonderful opportunity to thank them for their hard work. The choir presented us a whirlwind tour of musical styles – from Enya to Amazing Grace, and everything in between. My personal favourite was the closing number, a rendition of Carole King’s You’ve Got a Friend, for which the audience was invited to participate in the closing riff. A stunning way to end the concert, and the choir were rewarded with an enthusiastic standing ovation by the appreciative audience. The opportunity to mingle with the choir and enjoy a well-earned cup of tea was taken by many present, as our afternoon with the Joint Force Singers drew to a close. Six months in to the project, it is wonderful to reflect on how far the choir have come, and this Saturday’s concert was a real testimony to that. Westminster Music Library are proud to be the pioneers of this musical adventure, and we eagerly await the next six months! Last Tuesday’s Christmas showcase at Westminster Music Library was anything but a “Silent Night”, as our very own Joint Force Singers Choir gave their debut public performance in festive style. Keen followers of Westminster Music Library’s community events may already know about our flagship choir, whose activities so far have included interactive workshops in the Library, part of a special festive concert at Lord’s Cricket Ground, and joining some of the Garrison’s army musicians at The Wellington Barracks Christmas market. Tuesday evening’s event, however, was particularly significant; this was the first concert put on exclusively by the choir and open to the public. As well as having a huge turnout from our local community, guests of honour included Tri-borough Director of Libraries Mike Clarke, London Garrison Welfare Officer Sergeant Tim Heale, Royal College of Music Chief Librarian Peter Linnitt, and Westminster Councillor Rachael Robathan, the City Council’s Armed Forces Champion. Although the concert was organised by the Westminster Music Library Team, this was something of an opportunity for us to step down from our usual roles as performers and allow Joint Force Singers to take centre stage. The Joint Force Singers Choir, formed just three months ago, presented the jam-packed library with a tasteful mixed programme of choral works and participatory carols. However this was no typical Christmas programme, alongside irresistible classics like Away in a Manger were some less familiar tunes. Would a typical carol concert contain rousing protest number The Diggers’ Song, or folk song Johnny Has Gone for a Soldier? No! – however, our Choir took these in their stride and the audience loved it. “Beautifully sung, an excellent and original programme, even the little children in the back row were in awe”, commented one attendee. We are proud that our choir stands out from others as being prepared to tackle unfamiliar pieces and challenge audience perceptions of what a Christmas concert should sound like. Leading the choir with characteristic flair was Ruairi Glasheen. From day one Ruairi has been highly valued as the Joint Force Choir’s Musical Director, and Tuesday’s Christmas concert gave audience members a chance to see his natural charisma in action. As well as coaching the choir week by week, choosing repertoire and conducting, Ruairi revealed he had another hidden talent: playing the bodhrán (* see below). Instead of conducting the first piece, he kept time with a constant drum beat, which not only brought The Diggers’ Song to life but also delighted the children in our audience. We can by no means neglect to mention our faithful accompanist, Hélène. With the piano decked out in tinsel and fairy lights, her brilliant playing provided a steady anchor for our singers. With such talented individuals leading our Choir, it is no surprise that they were on top form. My own personal favourite carol, Hark! the Herald Angels Sing was sung in perfect four-part harmony, and the brave sopranos who performed the descant part in the last verse deserve special mention. A yuletide classic – We wish you a merry Christmas was transformed into Merry Christmas Cha-Cha-Cha: a lively arrangement of this much loved Christmas song – the altered rhythms of which threw off any audience members attempting to join in, but were an impressive example of the choir’s accuracy of timing. For such a young choir, and with so many having no previous formal singing experience, the concert was hugely impressive, and a sure inspiration to our audience. Many commented afterwards that they couldn’t believe the Choir had only been rehearsing for just three months. There are still a few places available in the Joint Forces Choir for anyone wishing to join – just email jointforcesingers@gmail.com. No singing experience required! 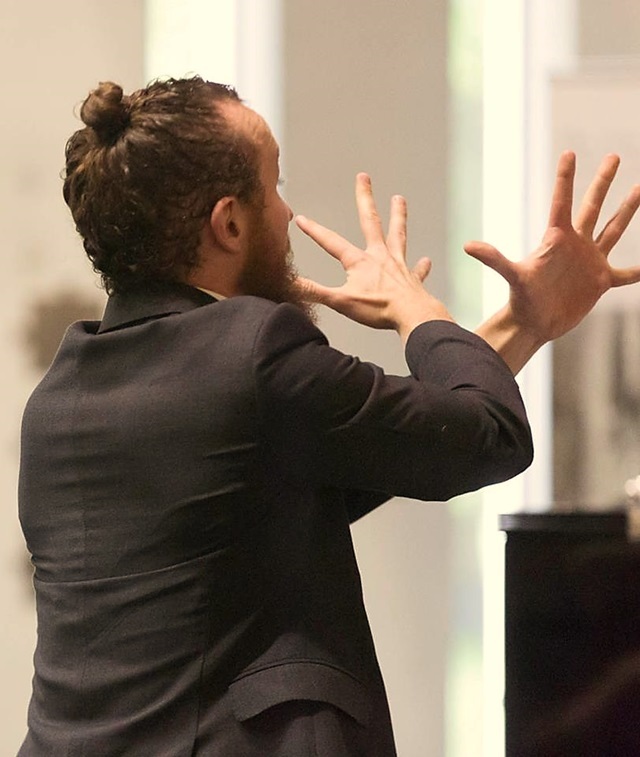 We are nearly half way through our year-long Joint Force Singers project, but fear not, we have many more exciting performances planned at prestigious venues across Westminster. For more information on the Choir and its background, take a look at this previous blog post. We are thrilled by the success of our Choir’s debut public performance, and are sure of great things to come. If they can put on a brilliant Christmas concert “in the bleak mid-winter”, they can do it any time of year. 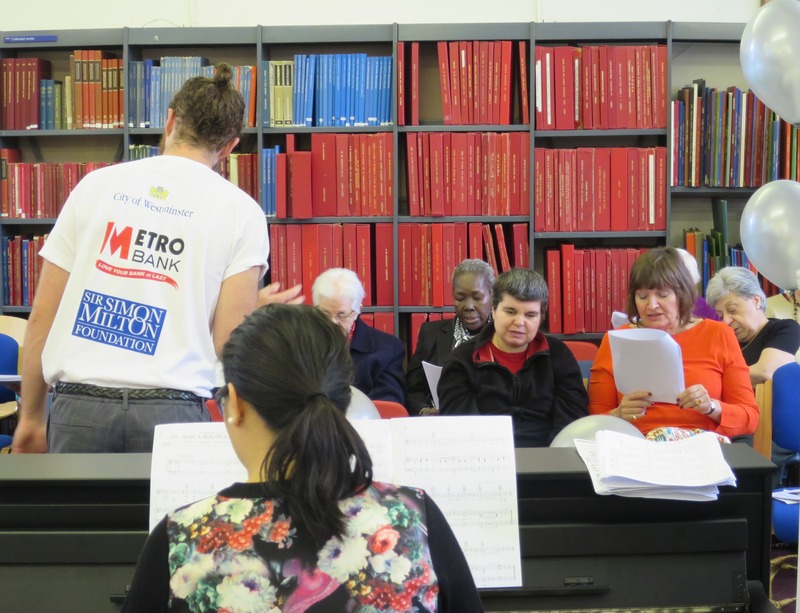 Westminster Music Library was filled to the brim this Saturday for a hugely popular choir workshop which, with record attendance, topped even last year’s number of participants. 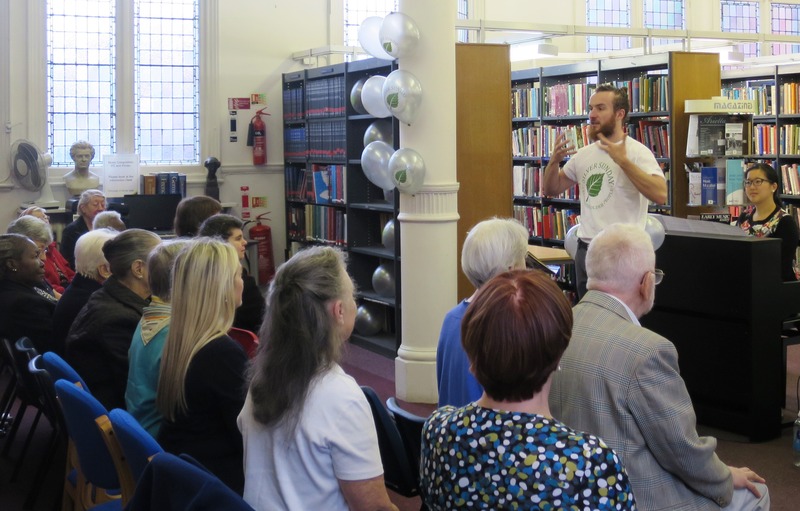 Over fifty keen songsters rose early on Saturday morning to make music among the bookshelves, until it truly was standing room only! The event was one of the many hundreds of events put on across the UK to celebrate Silver Sunday, a nationwide annual day to “celebrate older residents and help them get out and about and meet new people”. This year marks the fourth consecutive Silver Sunday and we were thrilled to be a part of it. Observant readers will notice that there was something unique about our event: namely, we hosted one of the only Silver Sunday events to be held on a Saturday! 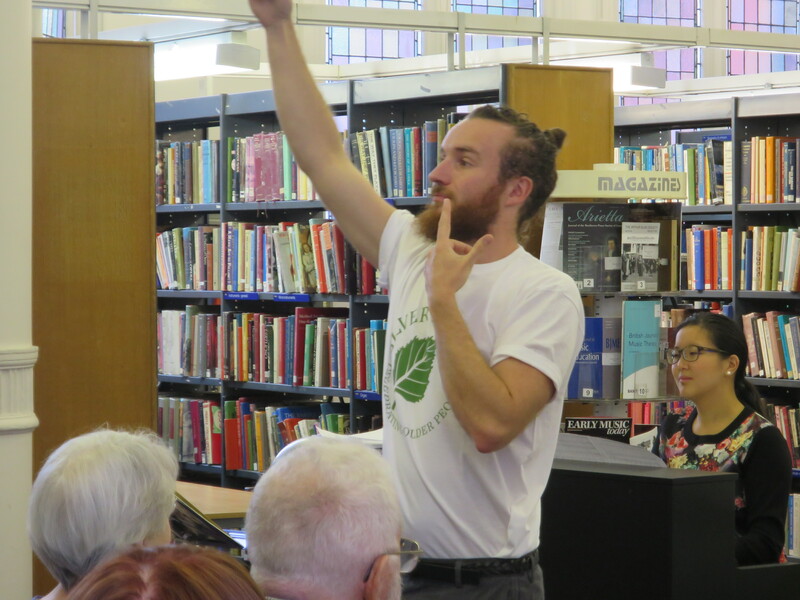 Our library’s opening hours necessitated this change, but, of course, it meant that all our attendees were able to join in with Sunday’s events, too. We were honoured to have in attendance the Lord Mayor of Westminster, Councillor The Lady Christabel Flight, who, with the Sir Simon Milton Foundation, has pioneered Silver Sunday from its beginning in 2012 and is still very much showing her support for as many events as possible! 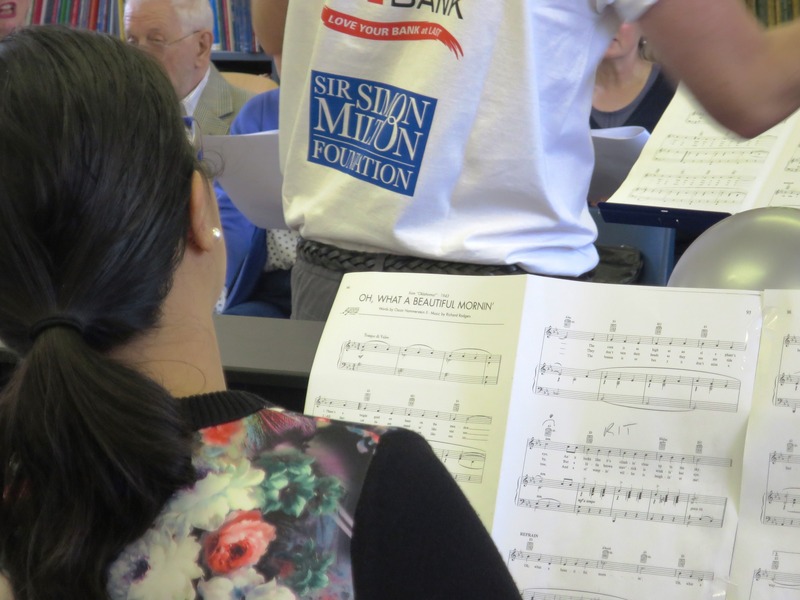 Keen followers of Westminster Music Library’s activities will be well aware of our year-long Joint Force Singers project in collaboration with Westminster Armed Forces. We were pleased to incorporate this choir project into our Silver Sunday event, as many of our choir members and non-members alike joined forces for the morning workshop. For our guests who weren’t members of the choir, it was a real privilege to join this established group of singers, and the choir’s presence gave the whole morning a real boost. We even had some non-members asking to join the choir afterwards! It’s not too late to join Joint Force Singers – if you live locally and would be interested in committing to our project, please contact Westminster Music Library. The familiar faces of Project Officer, Felicity, and Accompanist, Helene, were seen, and the whole morning was led by the wonderfully talented Ruairi, the Joint Force Singers’ Musical Director. Ruth and Jon from the Music Library were our hosts for the event, ensuring everything ran smoothl, and re-formatting the library in record time afterwards to ensure we could open our doors to the public at 1 o’clock sharp! 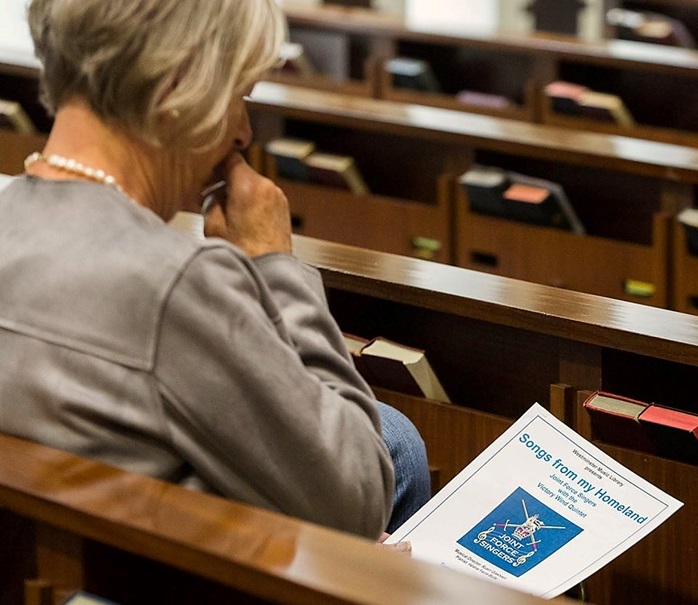 As the morning took the form of a workshop, our choir members experienced a change from their regular rehearsal routine, while, in Silver Sunday spirit, our non-members found the event to be totally accessible even to those with no previous singing experience at all. Ruairi took us through a wide array of physical and vocal warm-ups, games, and then was able to teach us a significant amount of music, all in the short space of two hours! By the end of the session, he’d had us singing in canon (the musical term for a round) and two-part harmony: a great achievement for a group of singers who’d only been singing together for one morning. Music ranged from traditional English, to Scottish, to Swahili lullabies, and everything in between. All over the world there is such a rich musical tradition and we were fortunate to be led on a short tour of it all by our knowledgeable Musical Director. 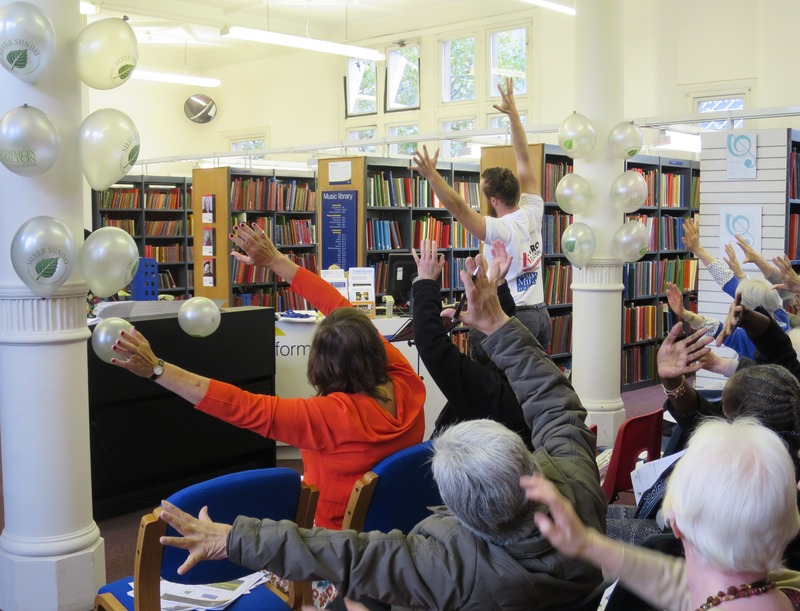 Hosting events is a passion of ours here at the Music Library and our next one also has a sing-a-long theme – this Thurday 8 October, please feel free to join us for a World War I-themed singing event in collaboration with the London Transport Museum’s ‘Battle Bus’ project. 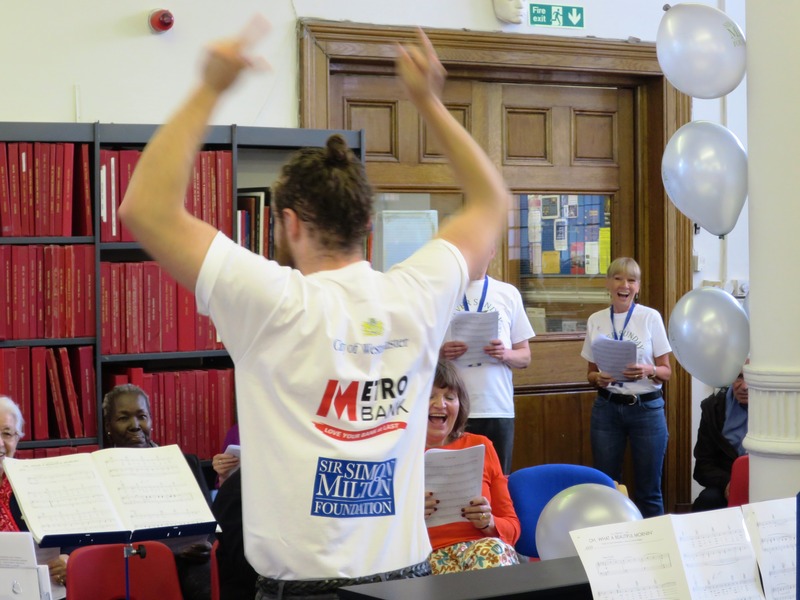 Joint Force Singers, the twelve-month choral collaboration between Westminster Music Library and Westminster Armed Forces, started on a high note last Saturday morning, as 30-or-so determined choir members braved the rain to attend its inaugural rehearsal. 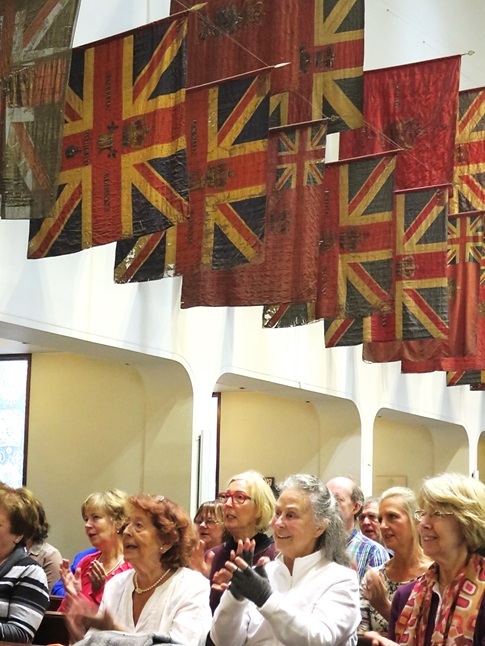 Young and old alike were joined in the Guards Chapel (the Royal Military Chapel) of Wellington Barracks, united by a love of music, to commence the year-long project. Since the project’s inception almost a year ago, a generous grant from the Community Covenant Grant Scheme and a lot of hard work have turned the dream into a reality. After much planning, publicity and recruitment, it was a joyous moment when our choir met for the first time and the music-making began. There are still a few spaces to fill in the choir and anyone is welcome to join for free who would be interested in this exciting project. The morning began with Tim Heale, London Garrison Welfare Officer and member of the Joint Force Singers Steering Group, introducing the choir to some of those who would be leading the project: Ruairi (Musical Director), Felicity (Project Officer) and Helene (Accompanist). Ruth Walters, choir founder and Westminster’s Music Services Co-ordinator, was unfortunately unable to attend but Jon from Westminster Music Library was present to document the morning. After Tim’s welcome, the choir launched straight into rehearsal with great vigour. Despite the blustery rain coming down outside, Ruairi’s enthusiasm was infectious and his wide range of singing exercises soon got us all warmed up both vocally and physically! With Ruairi at the helm, this is sure to be no “stuffy” choir, as many choir members commented during the tea break. We are indeed fortunate to have such talented musicians leading the rehearsals. 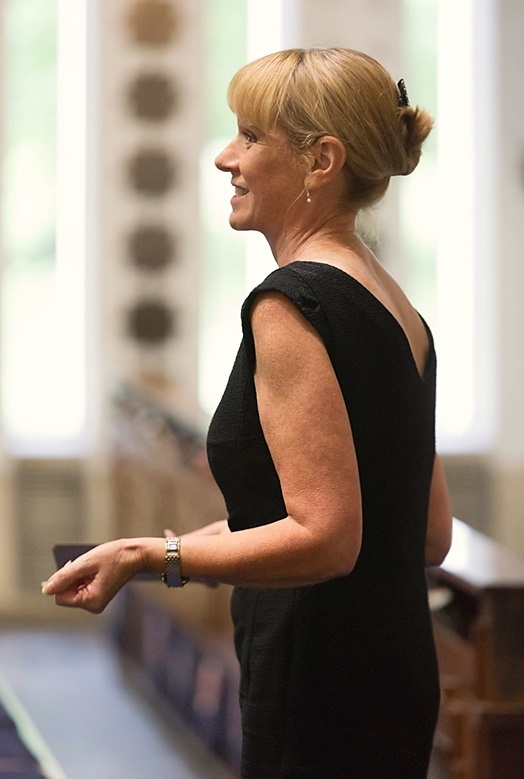 Accompanist Helene has studied piano accompaniment at one of London’s most prestigious conservatoires, the Guildhall School of Music and Drama, while Project Officer Felicity Hayward is herself an experienced singer and project leader. With such an accomplished team to steer the choir, we anticipate high-quality music-making to be associated with the Joint Force Singers’ from the very beginning. Ruairi continued rehearsal with the familiar ‘My bonnie lies over the ocean’, but if anyone in the choir thought they knew it already, they’d certainly never done it like this before! Ruairi had the choir sitting and standing every time a word began with “B”, and clapping on every “M”. I can’t imagine what a casual observer may have thought, had they happened to see this group of singers standing and clapping at seemingly random moments, giggling away the whole time! While the game may have appeared silly, its fruit was evident as soon as we moved on to the next song, ‘Nanuma’, a Ghanaian round. By getting us to move together in ‘My bonnie…’, Ruairi had instilled a sense of togetherness in the newly-assembled choir, and as a result they learned the new song in no time, with beautiful results. It was clear that Ruairi’s directing technique produced incredible results in no time – and the choir had fun, too. An interactive rehearsal and workshop will also be happening on Saturday 3 October at 10.30am at Westminster Music Library: a perfect opportunity to drop in and see what the Joint Force Singers are all about. A number of high-profile concerts are planned over the course of the year, the first being on Tuesday 15 December at 6.00pm at Westminster Music Library.